To celebrate the 1 month anniversary of Modest Money, we want you to win an iPad2! 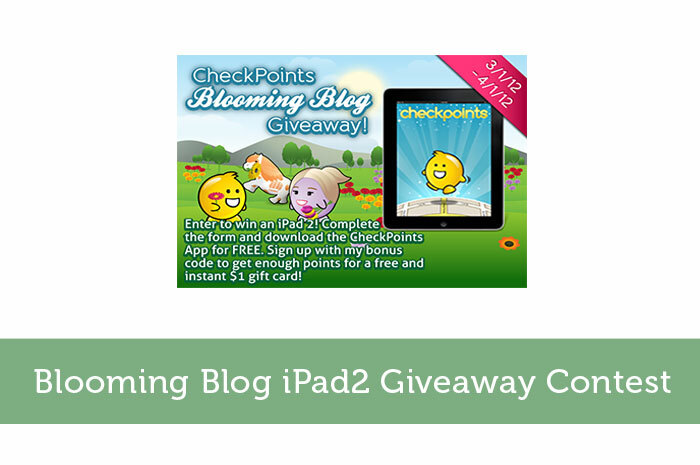 The Freebie Junkie, CheckPoints and 49 other great bloggers are offering one reader the chance to win an iPad2 in our Blooming Blog iPad2 Giveaway. First download the CheckPoints app for your Apple iPhone or Android mobile device. Then simply fire up CheckPoints whenever you go out shopping. Check in your location and you will discover nearby products that you can scan to earn points. You even get points for simply checking in and then redeem your earned points for a variety of rewards: from gift certificates to many of your favorite stores or restaurants, to airline miles and must have electronics. You can even give back to your choice of charitable causes. Just for my readers, here is a special promo code – when you sign up for an account with CheckPoints, use the code: modestmoney and you will automatically get enough CheckPoints for a free (and instant) $1 gift card or charitable donation. So sign up (iPhone) (Android) and do not forget to use the modestmoney code to grab your free CheckPoints! There are 50 participating blogs in this contest, but you only need to enter the giveaway on one of our blogs. Good luck! Well I guess I’m screwed, I don’t have an Apple iPhone or Android mobile device. I’m in the same boat. I don’t have an iPhone or Android mobile device. So I can’t take advantage of CheckPoints. You can still enter the contest to win an iPad2 though. What a great giveaway to be a part of! I hope you dont mind me asking, but how did you all organise this? I’d love to take credit for some of the organization, but I was simply referred to this group giveaway by a blogger friend. One of the bloggers on this list organizes it all and they do other similar contests. E-mail me if you want me to send you some links to their other contests. I’m sure there are other groups of bloggers pooling together to do giveaways too. Thanks Nick. I thought it seemed like a cool opportunity too. I couldn’t afford to give away an iPad2 on my own. Plus this contest gets exposure for the whole group. Wow! Seems like you’ve collected a ton of entries! Yes there are quite a few entries than that, mostly from the more established blogs though. i like freebie entered to waiting mail from you that i am winner. Good luck with the contest Arun. wow. lots of people. i could definitely use an ipad2 for movies. Yes, definitely lots of entries so far. I guess it’s not too surprising considering the value of the prize and multiple ways to enter. I would watch movies and follow blogs. Thanks for entering the contest Teresa! Good luck! I would let my kids play games, face chat with my husband when he is away and read books! Thanks for entering Miranda. If this contest was just about good reasoning to want an ipad, I’d proclaim you as the winner right now. Unfortunately I have no say in who wins and it is just a random draw. Good luck though! Thanks for entering. Best of luck this time around. I would use the Ipad for saving money! I don’t have an Android or Iphone & it seems like there are a lot of electronic coupons, apps like CheckPoint, etc. out there that I could access with one. Thanks for helping host this contest! Good luck Karen. I hadn’t thought of using an iPad to save money. Most people just want to use it for entertainment. this would be great for school and blogging work!! Yes I wouldn’t mind having one to help with my blogging work. I’d rather not carry my laptop around, but it would be practical to bring an iPad with me to a friend’s house or to the park. Use it to surf the web and for work. Thanks for the chance. For surfing the net and recording appointments and notes. Good luck Shirley. I guess a tablet computer would be pretty handy for keeping organized with meetings and other appointments. Best of luck Melody. It would be a great way to keep the kids entertained. I’d be a bit worried with young kids playing with such a pricey device on their own. I would use it to download educational apps for my daughter to play with. Awesome idea with the educational apps. That’s probably a great way to get kids learning at a young age. Good luck Kim! Yes they are extremely versatile. Good luck on the contest Sammi. for games, teaching activities, notes, cooking, and much much more! Cooking is another great use not mentioned yet. I know I’ve looked up a recipe on my computer only to run back and forth from the kitchen. Wishing you good luck Crystal. I would use it to surf the web and play games!! I’m sure there would be some pretty cool games for the iPad. That’s got me itching to play some Angry Birds now. Good luck Lauren. Great giveaway, and a neat app! Ready to start using it! Hope it’s as fun/easy/useful as it looks. Thanks for the giveaway and good luck everyone! Good luck Kim! If I had a smart phone, I’d be all over the CheckPoints app too. It sounds like a very useful app. Oh flapjacks! It’s open to US residents only. I’ll still answer though, because that’s half the fun. If I won an iPad, I would stay up until 3:00am on Fridays playing Settlers of Catan (in bed). …I might’ve already done that last night on my phone, so really, do I even deserve to win if I could? Sorry about the contest restriction! I was disappointed myself when I noticed that. I guess it’s a bit ironic that a Canadian blog would be co-hosting a contest that is only open to US residents. It’s too bad they don’t just add a stipulation that international entries have to cover all the shipping and duties. Totally, because I would be more than willing to pay the shipping on that badboy! As a Canadian, I am used to getting the short-end of the stick when it comes to contests. I am fine with it though, especially since I’d rather keep my Smarties, Beaver Tails and poutines. You forgot to mention ketchup chips. For some reason Americans haven’t figured that out yet either. Little do they know what we’re enjoying up here in our igloos. I’d love to redeem my rewards for a Sephora gift card! Good luck Katy! I had to look up what Sephora was lol. That’s always a good prize to redeem points for. Good luck Colleen! Want to buy a used one? I haven’t used mine in forever. Good luck Makayla. i would get Amazon gift cards with my points. With so much to choose from on Amazon, it’s not surprising to see another person choosing that option. Good luck Lisa. I’m not sure what I’d get, so for now I’d get an Amazon gift card so I can make up my mind later. Yeah it’s the first contest that I co-hosted and thought it was a pretty cool setup too. I don’t have a smart phone(can you believe that, must be the only one that doesn’t). An ipad would be so handy and easy to carry when I don’t want to drag along my laptop. Don’t worry Deb. I’m in the same boat. At least I can say that my phone still fits comfortably in my pocket and I’m not tied to a 3 year contract. Good luck on the ipad draw. I’d go for the Amazon.com Gift Card. That seems to be the popular choice. I guess it’s the closest to cold hard cash. Good luck Kanwal. Amazon gift card—they have it all. I’d either choose an amazon gift card or wii console, time to get fit! Another person still wants a wii? E-mail me and I’ll sell you mine for cheap. Good luck Aayah. Funny when the contest entry comment question changes but some people still answer the old question. Well good luck Kyl. I have never heard of this app before but I can install on iPod touch. If you do install it, let me know how it works for Canadians. Some of these kinds of apps just focus on US stores. With all these people still wanting a wii, I might have to do a blogpost on here offering to sell mine. It was fun when I bought it, but eventually I got tired of having to move the coffee table and recharge batteries. I would like to redeem my points for an amazon gift card!! They do come handy!! Good luck Saida. Yes an amazon gift card would be handy with the huge selection they have on there. I would redeem it for an Amazon Giftcard. That sounds like a good choice too 🙂 Good luck Gloria. Good luck Dagmara. That’s another vote for Amazon gift cards. I would redeem the points for Amazon gift cards! Good luck Samantha. Got in on the second to last day. I like the Fandango gift card. Cutting it close Rosey. The contest ends later today. Good luck! Good luck Tina. Another person squeezing in hours before the deadline. I’d like to redeem points for a Shell gas card. Sorry Betty but I think you missed the deadline for the contest. Thank you to everyone who entered this contest. I was a bit surprised by the response. The contest is now officially over. The winner of the iPad2 will be contacted shortly. Good luck everyone!